Some Windows users may wish to run the Apple Safari web browser on a Windows PC. Usually this is developers or designers who need to confirm compatibility or to support a particular end user experience with the older Safari PC browser. Well there’s good news if that describes you; it turns out that you can download, install, and run Safari on Windows still, even running Safari on Windows 10. But there’s bad news too, and a bit of a catch: it’s an old version from 2012. This is because Apple discontinued development of Safari for Windows several years ago, and thus current Safari for Window version is dated, missing many features, isn’t up to date with security patches, and likely has some other issues too. Accordingly, it is not appropriate for most users to download and install Safari in Windows, but it is available if you need it for whatever reason. The version of Safari for Windows you can still download and install is Safari 5.1.7 and it installs and runs on Windows 10, Windows 8, or Windows 7 without incident. Despite being many versions behind what’s available on a Mac, Safari in Windows runs fine, though since it’s an earlier web browser version from some years ago you will find that some of the newer fancier rich web features are not supported, and there are numerous potential security flaws. This is not recommended to use by typical users or as a typical browser on a PC. Only advanced users, developers, designers, and compatibility testers who specifically need Safari on Windows for a particular reason should bother to install and run Safari within Windows. Remember, this is an old version of Safari, it is not supported by Apple, it is no longer in development, and it has been abandoned. You’re entirely on your own if you want to run Safari in Windows. Don’t do anything important or serious with it, remember as an old version it is lacking many modern web technologies, it has not been patched for modern security and privacy issues, and there could be a host of other problems. This is really only for advanced users. 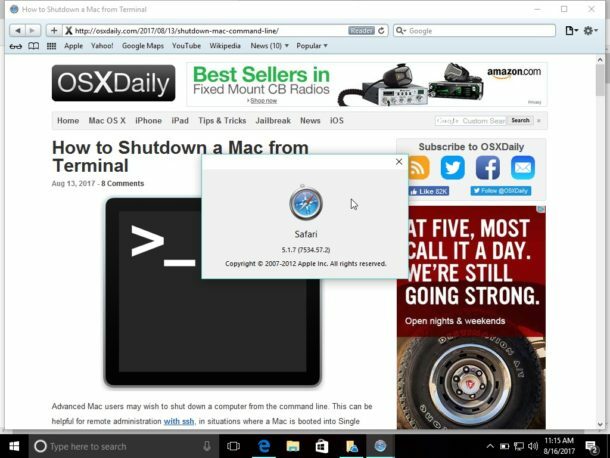 Why download and install Safari for Windows? Why run old Safari versions today? You’re probably wondering, why bother downloading and installing Safari for Windows, when it hasn’t been supported or in active development for years? The answer for most users is; you don’t need it. But, for other advanced users, like developers, designers, compatibility testers, support techs, and other similar situations, it can be necessary to have older browsers available for testing purposes or for supporting a particular client. That’s a bit like how some Mac users run old IE versions along with new releases of IE like Internet Explorer 11 or Microsoft Edge in Mac OS too for the same testing purposes – it’s not relevant for most people, but some need it for various reasons. 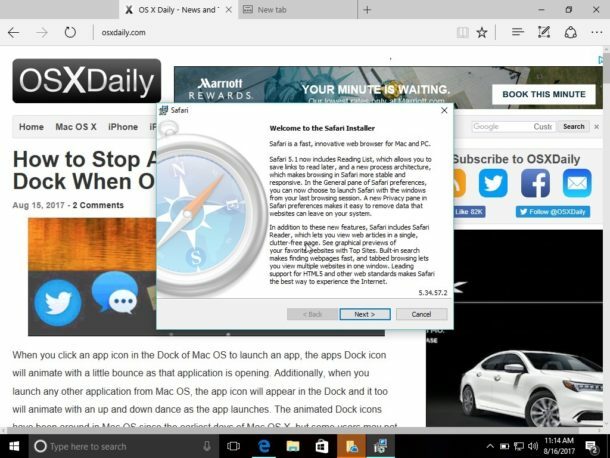 Should you use Safari for Windows full time? No, most certainly not. If you’re a Windows user in need of a web browser you would be better off running Edge, IE, Chrome, or Firefox, simply because those browsers are still maintained while Safari for Windows is not. Nonetheless, if you do need it, you can run Safari on a PC if you need to for whatever reason. It’s hard to imagine a scenario where any Windows 10 user would need Safari on Windows but I suppose it exists out there. It would be even harder to imagine anyone wanting to use ancient browsers in modern environments. A better solution if you ask me is to use Chrome or Edge and then spoof the User Agent for Safari. As far as testing goes, that should be sufficient. Or just get a Mac, and test the web app with Safari in MacOS, iPad, iPhone, via Xcode or what have you. Here’s one. Person uses Mac at home and forced to use Windows 10 at work, and they are looking for a unified browser experience – extensions, bookmarks, autofill , etc. In this case they might want to use Safari on Windows as well as MacOS. I think you’re so way off here. How on earth would an old version of Safari give a unified browsing experience? The biggest reason someone would need to use Safari in a Windows environment is for cross-browser compatibility testing for web development. 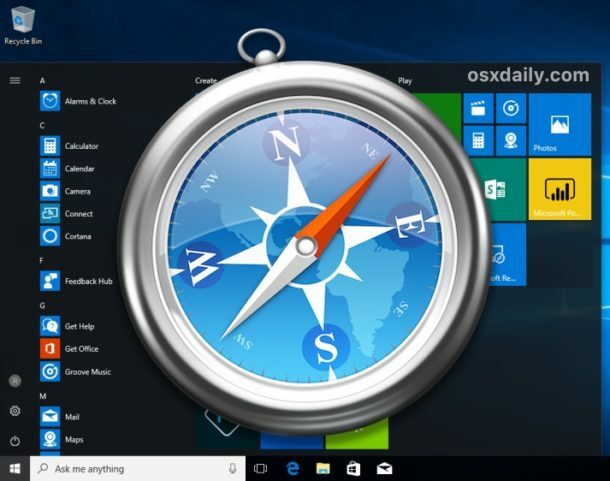 Because Apple is so widely used, and Windows is the standard for business/corporate development jobs (not to mention very few companies offer each of their developers an iPhone for cross-browser testing), it is imperative to have access to a genuine Safari browser interface on a Windows PC. Jamf software for windows DEANDS you use Safari to register devices. Safari is TOTAL CRAP! Why would anyone want to do this if Safari for Windows is no longer being developed? THIS IS BAD ADVICE. DON’T DO THIS. If you are developing on Windows and don’t have access to a Mac, install MacOS on a Virtual Machine using VirtualBox (or VMWare or any other virtualization host). You’ll be using a browser that Mac users are actually using (rather than ancient, unsupported versions which most won’t). You’ll have access to modern debugging tools. You won’t be second-guessing if something isn’t working due to your code/markup being bad or the ancient version of Safari not supporting modern code/markup. Again, there is absolutely no reason to do this. It almost certainly be counter-productive. There is no advice contained here, it’s merely offering the possibility of having Safari for Windows if you need it for some reason. An outdated version of Safari Windows is what Apple continues to offer as a download. Believe it or not, some people may need it, so that is why Apple probably offers it. There is not advice, advice would be guidance, whereas information is simply a fact. For example, knowledge that a tiger will bite you is not advice to have a tiger bite you, it’s simply information stating a fact that tigers may bite. Or just because you can buy 35lbs of sugar at the grocery store is not advice to do that, it’s simply available. People have free will (for now anyway!). As for whether or not you need this, well you probably don’t but you would know better than someone else. Is there no critical thinking skills out there? There are, but you seem to be lacking grammatical skills. Hint: you can disagree with me (and you made some good points) without getting personal and nasty. It was not necessary. Do your homework, sport. Mac OS can only be run in a virtual environment on Mac OS hardware. It cannot be run on Windows, regardless of the virtualization software. Safari for Windows is the only browser allowed in our company (1000+ employees). Other browsers are not allowed. Has anybody tried this and confirmed the download doesn’t include viruses? The URL looks fishy. It’s an official Apple CDN URL. I wonder why Apple killed off safari for windows? Lack of interest maybe? It’s pretty good for mac now. Is there a way to in encrease the cache usage on safari? This is still better than the old version of windows explorer that you can get for macs. I presume you meant Internet Explorer and not Windows Explorer. A good friend asked me if I could help him with a document he received via email, because he couldn’t open it. I asked him to transfer the whole email to me, and when I got it there was an attached file ending in ‘.webarchive’. Now you all know that there’s no Windows application that’s able to open a Mac web-archive with a single web-page in it. What would you do if you only had a Windows PC available ? Well, you’d likely as not attempt to open it with Safari, but you don’t have a Mac readily available … so you temporarily install Safari-for-Windows – it’s a lot faster than the installation of a virtual machine (using VirtualBox or VMWare or w.h.y. ), then of MacOS. This is precisely why I need Safari for Windows: to be able to read all of my .webarchive files that I saved when using the earlier versions of Safari for Windows :)))). Thank you so much osxdaily for providing the link to the download. Shame on Apple for not doing so on their Safari support page for Windows. The files can be read with a text editor, but they do not display as a web page and one has to scroll down extremely far to get to the text one needs to read. Well, Maybe we want safari because all the so called “modernized” browsers are blocking adobe products, you know, the products that are the core programming of most of our favorite site’s like kongregate and armorgames.